On this #OMFScienceWednesday we are happy to introduce a wonderful addition to our team, Michael Sikora. 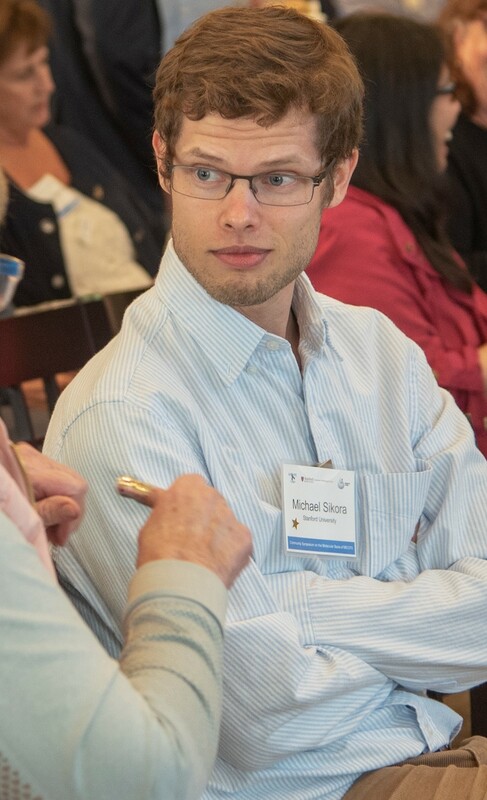 Michael presented at the recent Community Symposium on the Molecular Basis of ME/CFS at Stanford University. “I majored in Biology with an option in Genetics for my bachelor’s degree at The Schreyer Honors College at Penn State University. There I was interested in population genetics, which utilizes genome sequencing to determine the demographics of human populations. My Honors Thesis titled “Modelling Male Demographic Histories from Y-chromosome Data by Measuring Star-shaped Genealogies” was largely completed while working at the Wellcome Trust Sanger Institute in Hinxton, England. In this work, we estimated the rate of European and African population expansions based on Y-chromosome data and found an extremely fast expansion rate in the European population during the Neolithic transition. Following my undergraduate degree, I went to the Genetics program at Stanford University to attain a PhD. There I joined the lab of Lars Steinmetz, a former PhD student of Ron Davis. Much of my PhD work has been at the intersection of technology and immunology. Together with Huang Huang, who is in the lab of Mark Davis, and Saiful Islam, we developed a method to select single cells based on the expression of a target gene for high-resolution whole transcriptome sequencing. We apply this method to CD8+ T cells by first screening T cell receptor (TCR) sequences to precisely select clonally expanded T cells. T cells are cells of the immune system that can detect infected cells and kill them. In addition, they will clonally expand. This means a cell duplicates itself, increasing the number of cells specific for a particular infection. However, this response is very specific and will only occur if the T cell recognizes an antigen. Initial work has shown that this clonal expansion is observed in significantly higher levels in ME/CFS patients relative to healthy controls. This suggests that the immune system is activated in ME/CFS patients. Thus, in collaboration with Ron Davis, we are applying our single cell screening approach in the context of ME/CFS. Initial results suggest that we do indeed observe increased activation of the immune system in ME/CFS patients and that these T cells may be killing infected cells, or healthy cells, as in an autoimmune disease. Initial results are promising but still in its infancy so we plan to further characterize more cells of the immune system and elucidate the mechanisms that are leading to clonal expansion of CD8+ T cells. Thank you, Michael, for bringing your expertise to ME/CFS and your eagerness to contribute to research that will help millions with this disorder.